For Social Worker - Graduate in Life Science with 1 or 2 years experience in field work with computer skills. For Data Entry Operator - Graduation in any discipline from reputed university with having computer knowledge with good typing skill maintain database along with secretarial skills. 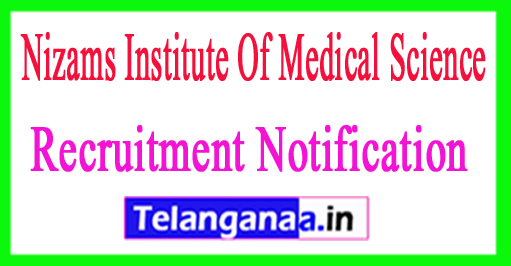 How to Apply - Interested Candidates may apply in prescribed application form along with attested copies of all relevant documents send to Dr. G.Sadashivudu, Principal Investigator, Associate Professor, Department of Oncology, Nizams Institute of Medical Science, Panjagutta, Hyderabad-500083 on or before 15.07.2017.